In this respect, recent developments such as Russian airstrikes on the ISIL (Daesh) targets by boosting its military presence in northern Syria in support of President Bashar al-Assad, the Defense Department’s announcement to abandon the goal of training the Syrian rebels, failure of the CIA-supported rebels to topple his government, Russian President Putin’s coalition with Iran, Iraq and Syria to root out the ISIL militants, his warning to the Israeli P.M. Netanyahu regarding Israel’s violations of Syrian sovereignty, indicating the Zionist regime in the US and Israel for their “phony war on ISIL”, and saying, “NWO (New World Order) agents and Satan worshipers simply have no clothes”, and description of Syrian drastic situation by the analysts as the most spectacular US foreign policy disaster have clearly exposed reality behind the so-called global war on terror, while, showing that America’s Zionist-framed policies have now started backfiring on the patriot Americans. 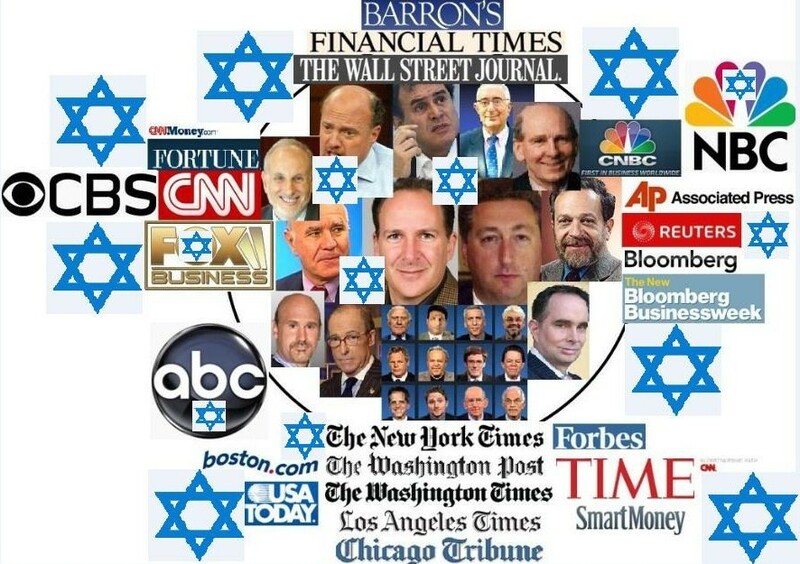 In fact, Jews are owners of the many big cartels of the US in particular and the world in general. Based in the US, by running the major multinational corporations, arms factories, five star hotels, oil companies, liquor business, banks, film industry, print and electronic media on international level—having influence on the financial institutes like World Bank and International Monetary Fund, Jews have direct and indirect hold on the global economy. Thus, by dominating the American internal policies, Zionist Jews mould country’s foreign policy for their own interests. In this connection, American President George W. Bush and neo-conservatives crossed all the limits in protecting the political, economic and religious interests of the Jews and Israel at the cost of Muslims and patriot Americans. Just after the September 11 tragedy inside the United States, chauvinism and extremism was deliberately developed among the Americans through media and statements of high officials of the Bush Administration. President Bush used the words, “crusade against the evil-doers”, adding to the perception that the ongoing ‘different war’ against terrorism is actually a war against the Muslim countries. Inside the US, suddenly, every Muslim found himself divested of his nationality. Inside the US, arrests, detentions and harassment of the Muslims by the CIA and the FBI were other steps which still continue. Israeli atrocities on the Palestinians were brushed aside. American unity was projected with such force as to allow no questioning of the US policy. Under the cover of the 9/11 catastrophe, preplanned strategy of the neo-conservatives headed towards a series of unexpected developments and events such as employment of coercive diplomacy on the weak states—Uzbekistan, Indonesia, Yemen etc., including almost all the Gulf states which decided to join Bush anti-terrorism war. Particularly, Pakistan became a frontline state of the US war on terror. US did not bother for rise of more militancy and internal instability in these countries. Bush also got the sympathies of other western and NATO countries for global war on terror. Besides, US and NATO attacked Afghanistan and then without mandate of the UN Security Council, American-Anglo forces invaded Iraq. Like the militants’ brutal tactics, US-led forces also employed state terrorism by special military operations, extra-judicial assassinations and heavy aerial bombardment, which killed several innocent persons especially in Iraq and Afghanistan. And suspected Muslims were also kept in Guantanamo Bay, Abu Graib and other cells, established in some Islamic countries and small European states where personnel of the CIA, the FBI, and the military employed various methods of torture like physical violence and even murder. However, the September 11 tragedy was fully manipulated by Israel who had joined the Bush’s anti-war terrorism enterprise so as to target Afghanistan, Iraq, Iran and Pakistan (Which survived due to American prolonged war in Afghanistan) in particular and other Muslim countries in general. For this purpose, Jews also got the services of some Hindus to continue their anti-Muslim campaign. In this connection, by availing the international phenomena of terrorism, Jewish-Hindu lobbies which are collectively working in America and other European countries have been exploiting the double standards of the US-led west regarding terrorism and human rights vis-à-vis Pakistan, Iran, Syria, Libya, Yemen, Egypt etc. Especially, Israel and India are still equating the ‘wars of independence’ in Kashmir and Palestine with terrorism. And New Delhi considers Pakistan as its enemy number one, while Tel Aviv takes Iran in the same sense owing to its nuclear programme. Israel is also against Pakistan, as it is the only nuclear country in the Islamic world. Notably, Indo-Israeli lobbies have introduced dangerous socio-religious elements in American and western societies by equating the so-called war on terror with war on Islam and acts of Al Qaeda and ISIL with all the Muslims—contributed to re-shape the global politics on cultural and religious lines. When Barrack Obama became American President, it was expected that he would rectify the blunders, committed by his predecessor in the name of war on terror, and he would resolve the Palestinian-Israeli dispute and issue of Kashmir between India and Pakistan. Instead, Obama-led US Administration continued indirect support to the Israeli atrocities on the Palestinians, while displaying silence over the brutal tactics, adopted by the Indian security forces in the Indian-held Kashmir. This ambivalent strategy resulted into more recruitment of Jihadists and suicide attacks, and it became difficult for the pro-American rulers of Saudi Arabia and other volatile Islamic countries to cope with the problem of militancy. Overtly, like Bush, President Obama also repeatedly stated that Muslims are moderate and Islam is a religion of peace, but covertly, he followed the agenda of the Bush to secure the Zionist-shaped policies. Learning no lesson from the US and NATO’s longest war in Afghanistan, facing defeatism in that country, Obama continued state terrorism and extrajudicial killings of the innocent persons through illegitimate drone attacks—assisting undemocratic forces, the return of a military strongman in Egypt by toppling the elected government, like Iraq, creation of more collapsed states such as Libya, Syria, Yemen etc., which opened the door for Al-Qaeda and ISIL activists, coupled with total failure to convince Tel Aviv to abandon “settlements,” and to end delaying tactics in resolving the Israeli-Palestinian conflict and the perennial humiliations of the Palestinians—starving people through Gaza blockade. Nevertheless, after 14 years of the protracted war, a perennial wave of attacks on the US and NATO installations and ambush assaults on their military personnel by the Taliban in Afghanistan, terror-attacks on Christians in Nigeria and other African countries including Iraq—sectarian violence and some terror-attacks inside America, France and UK deteriorated the global war on terror. Thus, President Obama caused political and economic instability in the world, jeopardizing the American global interests. Besides, a number of external and internal developments like huge cost of war on terror, financial crisis, and other-related problems which affected American public, and also enveloped other western countries—reluctance of NATO countries to join American war in Syria, including curtailment of liberties, failure of the of Obamacare, rift between the Republicans and the Democrats added to the dilemma of Americans. As a matter of fact, Jews who are about 2 percent of the US population and only about 4 percent of the electorate nationwide, mould the internal and external policies of America by setting aside the majority opinion of the non-Jewish American nationals. In other words, this odd phenomenon makes the American democracy a farce and rendered the nation’s claim of a free world, adhering to the liberal policies, asserting champion of human rights obsolete. However, by blindly following the Zionist-framed policies, President Obama has turned the US into a Jewish autocracy, and converted the dream of Henry Kissinger into reality. In this regard, the renowned writer, author and the social activist Dr. Stuart Jeanne Bramhall in her book, “The Most Revolutionary ACT: Memoir of an American Refugee” and in her various articles/blogs, while mentioning the leakage of Transpacific Partnership Agreement (TPPA), (An agreement to suppress sovereign democratic rights in favour of multinational corporations)— negative effects of globalization, pointed out Israeli lobbies, multinational companies/corporate industries, CIA operatives and some leading media houses which are working jointly and they do not care for world peace. According to Abraham Lincoln, “You can fool all the people some of the time, and some of the people all the time, but you cannot fool all the people all the time.” Nonetheless, in the present world of social media and Internet, now, patriot Americans have openly started criticizing the Zionist-protected policies of the US, putting questions that are they paying taxes to the CIA and military establishment (Their huge budgets) which are fighting useless proxy wars in the world, being fought for the sake of Israel in wake of modern global trends like renunciation of war, peaceful settlement of disputes and economic development. On October 20, this year, former Prime Minister of Pakistan administered Kashmir; Barrister Sultan Mehmood Chaudhry said that Kashmiri March is being organized on October 25, 2015 in New York in front of the UNO headquarter to press for just and durable resolution of longstanding Kashmir issue. He urged the Pakistanis and Kashmiris and Americans as well as those who believe in human rights and human dignity to participate in the Kashmir Million March to make it a great success. In this regard, invitations have been sent to Hurryat leaders of the Indian occupied Kashmir including Syed Ali Gillani, Mir Waiz, Shabir Shah and Asiya Andrabi (Hurryat Conference) and other leaders and dignitaries. The real aims of the Kashmir Million March is to express solidarity with the people of Kashmir and to draw attention of the international community towards Kashmir issue, displaying that this struggle would continue till the independence of Kashmir. Last year, People belonging to various segments of society including political parties and other important dignitaries came out on the streets of London in UK and participated in the Kashmir Million March to express solidarity with the citizens of Indian-held Kashmir in their decades-long struggle for the right of self-determination, protesting against the human rights violations by Indian troops in the Indian-occupied Kashmir. Despite the sinister efforts of Indian high officials and media to sabotage the Kashmir Million March, it held in the heart of London. In this regard, some Indian-backed miscreants threw bottles at the stage from where the participants of the March were to be addressed. In this respect, Barrister Sultan Mehmood said India’s sympathizers tried to sabotage the procession. It is notable that India has started a propaganda campaign regarding Kashmir. In this context, India claimed that on October 25, 1947, the then ruling Hindu Maharaja of Kashmir, Hari Singh had opted for accession to India by signing the instrument of accession and Indian Government had accepted it on October 27 1947. In fact, this act of Hindu Raja was in total contrast to the aspirations of Muslim majority of Kashmir, who desired to join Pakistan. India’s occupation of Kashmir was against the international norms and a “Standstill Agreement” signed by Hari Singh with Pakistan on August 15 1947. (Refer page 97 of Conflicts between India & Pakistan-An Encyclopedia compiled by Peter Lyon). Consequently, India inserted armed forces into Kashmir and forcefully occupied it. The people of Kashmir retaliated by fomenting an indigenous resistance movement against the Indian intruders. As a matter of fact, India occupied two third of the territory of Jammu and Kashmir known as 1ndian occupied Kashmir, whereas one third area was liberated by local Muslims as Azad Jammu and Kashmir. Since then, New Delhi has been suppressing the innocent people of Indian dominated Kashmir through mass extra judicial killings, forced disappearances at the hands of forces—gang rapes, indiscriminate use of force and torture, firing on demonstrations, custodial killings, encounters, detentions etc. Since 1989, over 50,000 (By some reports nearly 100,000), Kashmiri people have been killed during the ongoing conflict), while, State Human Rights Commission (SHRC) has found 2,730 bodies buried into unmarked graves, scattered all over Kashmir—believed to contain the remains of victims of unlawful killings by Indian security forces. Several international agencies and UN have reported gross human rights violations in Indian controlled Kashmir. In a press release, the spokesman of the Office of the High Commissioner for Human Rights (OHCHR) stated, “The Office of the High Commissioner for Human Rights is concerned about the recent violent protests in Indian administered Kashmir that have reportedly led to civilian casualties as well as restrictions to the right to freedom of assembly and expression.” A 2008 report by the United Nations High Commissioner for Refugees determined that Indian-administered Kashmir was only ‘partly free.’ A recent report by Amnesty International stated that up to 20,000 people have been detained under a law called Armed Forces Special Powers Act -1958 (AFSPA) in Indian-administered Kashmir. Undoubtedly, the Kashmir dispute as recorded in United Nations document involves the right of “self-determination” which means the right of all people to freely determine their political status. UN Security Council clearly laid down that question of accession of the State of Jammu and Kashmir to India or Pakistan will be decided through democratic method of free and impartial plebiscite. The UN resolutions are still valid even though India has made many efforts to declare them bilateral after Simla agreement. It is a unilateral interpretation of the issue by Indian leadership to keep it in a cold storage. Despite passage of more than 40 years, India has not made any serious effort to resolve this issue. In this respect, New Delhi’s move of cancellation of recent Foreign Secretary level talks Islamabad is a point in case. In such a background, Kashmiri people have time and again been registering their voice to highlight their plight and attract attention of the world community to acknowledge their right of self-determination. It is mentionable that like the previous year, Pakistan’s recent serious and sincere effort at the annual session of the United Nations—the speech of Pakistan’s prime minister and his meeting with the American president, highlighting the Kashmir dispute and demanding its solution has infused a new spirit among the Kashmiri people. However, last year, Barrister Sultan Mahmood spearheaded the event. It is projected that Kashmir Million March not only highlighted the grave human tragedy in Indian-occupied Kashmir, but also called on Britain to play its role in helping the Kashmiris obtain their legitimate right of self-determination. The Barrister has also demanded of the United Nations to take notice of the killing of the innocent Kashmiri people as a result of firing on Line of Control. He remarked that the Kashmir Million March would be befitting reply to the Indian aggression. He also demanded that the Indian Prime Minister, instead of issuing provocative statements should withdraw 800,000 Indian forces deployed in the disputed territory. Barrister Sultan and Andrew Griffiths Member of the British Parliament and Chairman of the All Party Parliamentary Group (APPG) on Kashmir in the House of Commons also addressed a press conference in the British parliament ahead of the march, and pledged that people in electoral constituencies will be made the part of the Kashmir movement. Frustrated by the campaign of Kashmiri people, India through diplomatic channels raised the issue of Kashmir Million March with Britain in a meeting of Indian External Affairs Minister Sushma Swaraj with Britain’s Deputy Prime Minister Nick Clegg in London. India was also trying to project through media that Kashmiris are divided over organizing Kashmir Million March to be organized from Trafalgar Square to the 10 Downing Street. However, Kashmir is an internationally recognized dispute and cannot be resolved at bilateral level. Indian government’s propaganda of describing mass Kashmiri resistance as terrorist activity is an attempt to nullify the indigenous nature of freedom struggle in Jammu and Kashmir. 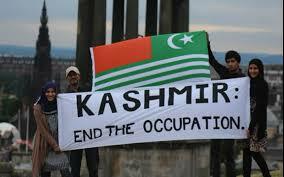 Despite India’s harsh and repressive measures, Kashmiri movement for self determination can not be suppressed. Pakistan being a legitimate party to the Kashmir dispute, by virtue of partition plan and UN resolutions, has right to support the cause of the right of self determination of Kashmiri. Nevertheless, Kashmir Million March organized in UK is true reflection of the aspirations of the Kashmiri people who are endeavoring to wake up the conscience of world community (Specially the super powers) to listen to their voice, and become aware of true face of democratic India. And the March is show of unity among the Kashmiri people, and a “signature plebiscite” against the Indian occupation and oppressive activities. By resorting to desperate diplomatic activities to influence UK authorities with regard to Kashmir Million March, New Delhi has acknowledged that it uses oppressive methods to gag the aspiration of the Kashmiri people. While, the March is also an encouragement for other oppressed communities of India to display their solidarity to the people of Kashmir and also highlight their light as well. It is of particular attention that the West propagates the freedom of expression and demonstration, so the UK Government upheld its traditions by allowing and fully supporting the said March. Especially, a petition was submitted asking the British government to impress upon India to resolve the Kashmir dispute. In a statement, Hurriyat leader Syed Ali Gilani declared the Million March a much-needed step and stated that it is to give the world a message that terrorism has no direct or indirect link to the Kashmir liberation movement and the people of Kashmir were struggling for their genuine right. Nonetheless, Kashmir Million March in New York would prove a milestone in the struggle of Kashmiris’ right of self-determination, and an obstacle to the intransigence of India which is using delaying tactics in resolving this old issue. Cricket was called a gentlemen’s game. So much so anything improper was proverbially equated as not being “cricket”. In the days gone by I remember an Indian outfielder making an outstretched catch at the ropes and the umpire having had raised his finger, but the Indian player shook his head that one of his feet was touching the rope when caught the ball and thus the Pakistani batsman was awarded a Sixer instead. Now that was cricket !! And today at Dubai Ian Bell kept standing, lingering rather craftily, till the third Umpire declared him out for having been caught behind off the ball touching his glove. Did Ian Bell not know that the ball HAD touched his glove? Why did he not himself make a graceful exit even before the wicket keeper made the appeal? I know it would sound strange to the present generation cricket players and the enthusiasts but can it be called cricket by any standards? !! PESHAWAR: The Khyber Pakhtunkhwa agriculture department on Wednesday launched a Rs1 billion Insaf Food Security programme to provide free authenticated wheat seeds to the farmers across the province. The programme was launched at a ceremony at the Tarnab Farms here, according to a statement. The programme would run for three years, benefitting about 1,068,000 farmers having land holdings of one to three acres. Speaking on the occasion, Minister for Agriculture Ikramullah Gandapur termed the programme as a landmark achievement of the PTI-led provincial government. He said the initiative would enhance wheat yield of the province by 186,000 tonnes adding Rs5 billion to the province’s kitty. Mr Gandapur said the programme would help meet food requirements of the province as well as ensuring prosperity of the farmers. “It would also help minimize expenditure on import of wheat from other provinces,” he added. On the occasion, Minister for Public Health Engineering, Shah Farman, said the programme would help farmers turn to cultivating high profit earning crops thus ushering the province into materialising its dream of agricultural prosperity. 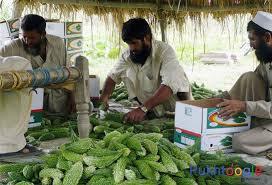 He said mushrooms and olive crops could be introduced in the province for prosperity of the farmers. Free wheat seeds were distributed to the farmers of the Peshawar district.